Make your little boy feel like royalty by building him his own king's throne. This craft will help engage your child's imagination and provide a creative piece to a regally-themed play set, bedroom or birthday party. You can build this king's throne from simple materials found at your home or local craft store. Customize the throne to your child's desire and experience the satisfaction of constructing his new play furniture with a personal touch. Select a chair with arms and a flat back and measure the dimensions of the chair's back. Cut a piece of cardboard, equal in width to the chair's back but one foot longer, and tape it to the back of the chair. Cover the entire chair with a gold sheet. Glue strips of purple velvet around the outline of the gold covering to add a look of royalty. 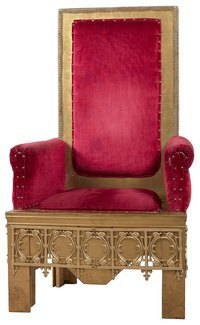 Pull the excess gold covering tightly and pin it in place at the chair's back, arms and legs. Cover each pin with a piece of red ribbon. Write the title "king" followed by your child's name with silver glitter glue across the top of the throne and allow time to dry before use to decorate the throne. Place adhesive gems where desired and position a red seat cushion on the throne for comfort.